This circa 1915 Bronze Neoclassical rams heads Dome Chandelier has garlands and fret work detail. Measuring 18" diameter, 40 long, this large cast dome chandelier is a great example of Neoclassical Revival. 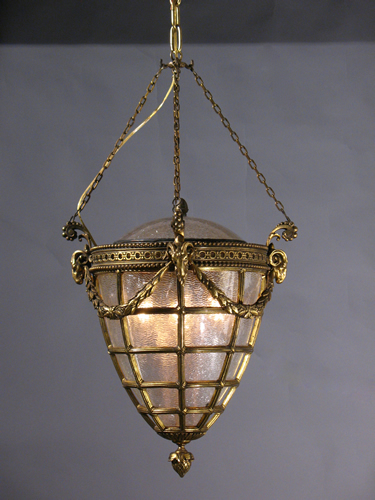 This is a great light for a large foyer, library, hallway or entrance way. We could very easily vault it so that it would work in a foyer with a second story ceiling. The cap on the top will will keep the viewer from looking into the electrical works if it is hung between floors.